Why Yes on 30 ? Without a skilled, educated workforce, our state will not be able to create new jobs to grow our economy. Investing in our schools is the best thing we can do to ensure a better future for all Californians. But today, our state ranks 47th nationally in what we invest to educate each child. We have the largest class sizes in the nation. Over the last three years, more than $20 billion has been cut from California schools and over 40,000 educators have been laid off. When these issues are raised, the anti tax radicals chant no new taxes. Now, the most immediate thing we can do is to pass Prop. 30 the Schools and Local Public Safety Act. – which would prevent $ 4.8 billion cuts from our schools and 1.3 billion in further cuts to colleges and universities. CSU avoids a $250 million trigger cut. Students receive $498 tuition refund. Provides revenue for future faculty bargaining. Does nothing for the CSU system, students, and faculty. Expected to generate over $7 billion annually and will balance the state budget by paying back debt to education. Expected to contribute $1.5 billion in 2012-13 and $3 billion thereafter to pay back state general obligation bond debt for only four years. All funding will go through the state’s general fund and helps repay the money owed to public education. These funds cannot be used to support the Prop. 98 guarantee and do not help pay back what is owed to public education. Creates another state special fund. Families with incomes over $500,000 and 0.25% increase in sales tax rate. The income tax increase focuses on high earners. Income taxes are raised on all income levels for almost all Californians. It will be a significant hit to the middle class. 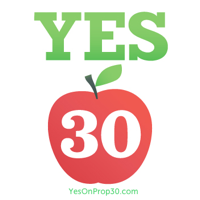 Education, labor and business support Prop 30 as it helps balance the state budget by paying down the wall of debt and providing funding for public education. Due to a narrow focus on K-12 and early childhood education, higher education and other essential services are left out.